As the opioid crisis rages on in Toronto, the city is increasing the number of outreach staff around the safe injection site beside Ryerson. Located across from Tim Hortons on Victoria Street, the site is a designated area where members of the public are able to consume pre-obtained drugs under the supervision of nursing staff. The move to expand outreach downtown is based on an increased need for the service, said Dr. Rita Shahin, the associate medical officer of health at Toronto Public Health (TPH). “The opioid overdose crisis continues to be a public health issue affecting many within our city,” Shahin said in a statement to The Eye. Between Jan. 1 and Sept. 3, Toronto police reported 183 accidental overdoses that were linked to drug-related deaths. On a larger scale, the rate of accidental opioid-related deaths in Ontario increased by 55 per cent last year compared to 2016. Research by the Ontario HIV Treatment Network has shown that supervised injection sites reduce overdose mortality rates, as well as the transmission of blood-borne illnesses such as HIV and Hepatitis C.
The site near Ryerson, located in The Works building at 277 Victoria St., was the first permanent site in Toronto. Three additional locations have opened up since. “The site was chosen because many individuals were already accessing this location for other harm reduction services,” Shahin said. The opioid overdose crisis and housing crisis are simultaneous, Shahin said. Many of those who access safe injection site services have experienced severe trauma and continue to face challenges such as homelessness and mental health, she added. She said there has been a significant increase in the number of Torontonians using the services at Victoria Street since it first opened in November 2017. More outreach staff, she said, will match the need. At the injection site, staff connect clients with health and social services, provide access to harm reduction supplies and pick up discarded needles. 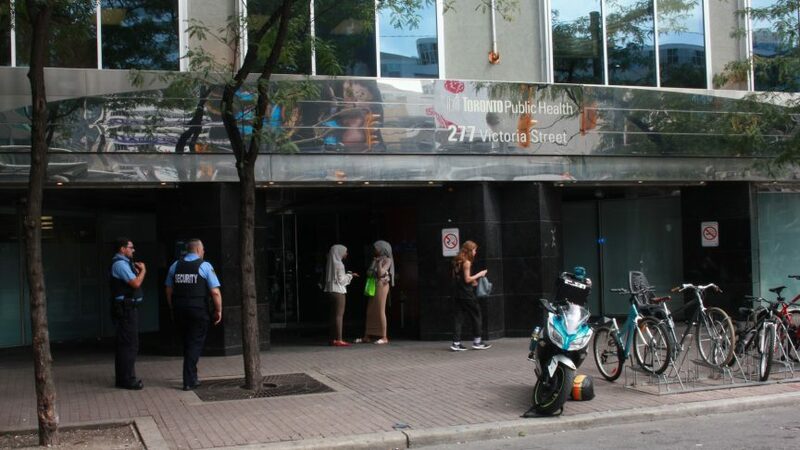 They are in the vicinity of the site near Ryerson seven days a week, from 9 a.m. to 11 p.m.
TPH’s security is present on-site from 5 a.m. to 12 a.m. from Monday to Friday, as well as from 9 a.m. to midnight on the weekends. Notably, TPH security and outreach staff are two separate entities. “These individuals have experience working in harm reduction, experience interacting with marginalized populations in the community and performing community outreach,” Shahin said about the new staff. Security officers from Ryerson also supervise the surrounding area since the Dundas and Victoria streets intersection is steps away from campus. to play in the safety and security of our community members on campus and Victoria Street is part of that,” said Ryerson President Mohamed Lachemi. In spite of the TPH staff presence and Ryerson Security services, some students are still reluctant to walk down Victoria Street. Of the 22 security incident notifications in August 2018, four occured on Victoria Street. All of them are filed under assaults. Campus Security did not provide The Eye with any official statistics of crime involving the safe injection site in time for publication. “During the day I’m fine. I usually go to the Tims [on Victoria Street], but I just feel like you have to be more careful,” said second-year Rye student Darshpreet Sangha. Over the summer, Ward 7 Toronto city councillor Giorgio Mammoliti visited Ryerson to advocate for the removal of the site. Mammoliti criticized the city for telling the police department not to show up to Victoria Street in events that concern substance users. But, to students like Sangha, increased police presence is not necessarily the answer. “Not everyone feels safe with cops on campus, or close to campus. I think Ryerson security should be there because [the site] is right off campus,” the biomedical science student said.